If you want to put together a truly unique gift for a friend or family member you can’t go wrong with a DIY gift basket. It’s the best way to put together some thoughtful and unique items to show them how much you care. And gift baskets can be used for any and all occasions too, from birthdays and Christmas to Baby Showers and housewarmings, and of course Mother’s and Father’s Day and as get well soon care packages. Oh and don’t forget welcoming a new neighbor! These DIY ideas could also be used to put together the most amazing items for your PTA or other charity fundraisers. 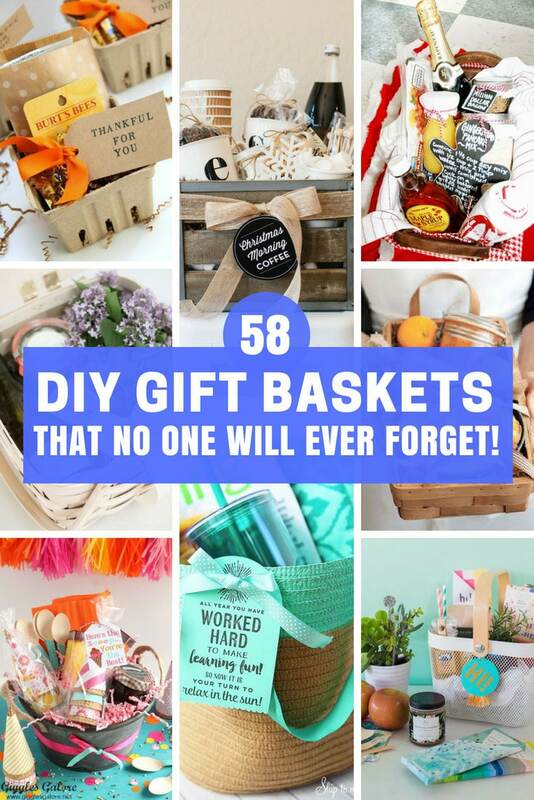 The important thing to think about before you start collecting up the items is that you don’t actually need a basket to make a gift basket. Oh no, you can be a lot more creative than that. The ideas I’ve collected up for you today will help you stretch your imagination so that your gift selection can be contained in a tackle box, a bucket, a mixing bowl, a pair of slippers and even a slow cooker! When you’re putting your “basket” together you’ll want to play around with the order of the contents so that the finished gift looks really stylish. It’s a good idea to use filler paper. which you can buy from Amazon or make yourself by running some colored paper through your shredder! If your gift basket is for a loved one make it even more unique by including a personalized item. From mugs and aprons to notebooks and pillows we’ve got lots of beautiful products waiting to personalize in our Zazzle store! Ok this isn’t an absolute must do, but while you’re putting your basket together think about adding in an edible treat for the recipient to enjoy while they’re exploring the other items in the basket! A sweet idea for a birthday in a box – and don’t forget the balloon! This gift wrap caddy would make a fabulous gift for someone who loves to give gifts!